Pietro Metastasio (3 January 1698 – 12 April 1782) was a poet from Italy. His real name was Antonio Domenico Bonaventura Trapassi. He was born in Rome and died in Vienna. For many years he was the poet laureate for the Holy Roman Emperor in Vienna. He is most famous for his librettos (the story and words) for operas. Many composers used them for their operas. More than 800 operas have a libretto by Metastasio. Metastasio was born in Rome in 1698. His real name was Antonio Domenico Bonaventura Trapassi. His father came from Assisi, a city in the Umbria region of Italy. His mother came from Bologna. Metastasio's father, Felice Trapasso, was a soldier in the Pope's army. Later he had a small shop in Rome. When he was a small boy, Metastasio liked to make up poems and say them in the streets near his house. His parents were poor and could not send him to school. When he was 10 years old, they sent him to work for a goldsmith (a person who makes things out of gold). One day a rich lawyer named Giovanni Vincenzo Gravina heard Metastasio saying his poems. He adopted Metastasio and paid for him to go to school. He also changed the boy's name to Pietro Metastasio. Gravina died when Metastasio was 20 years old and left all his money to him. Metastasio wrote a long poem in memory of his adopted father. It was called La strada della gloria (The Road of Glory). When he was a young man, Metatstasio worked as lawyer in Naples. In those days, Naples was famous for its music and its beautiful opera houses. 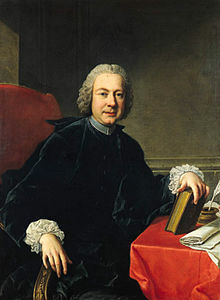 In Naples, Metastasio took music lessons from the Italian composer, Nicola Porpora. He liked to sing and to play the harpsichord. He sometimes composed his own music too. He also made money by writing poems for famous people's weddings and birthdays. He wrote his first opera libretto in 1724. It was called Didone abbandonata. It told the story of Queen Dido and her love for Aeneas, a Trojan prince. It was a great success. He stopped working as a lawyer and made all his money by writing librettos and poems. Soon, he was famous all over Italy for his librettos. Charles VI, Holy Roman Emperor asked Metastasio to come to Vienna to work as his poet laureate. In March 1730 Metastasio went to Vienna. He lived there for the rest of his life. He wrote many more opera librettos for the emperor's theatre. After the emperor died, Metastasio worked for the emperor's daughter Maria Theresa of Austria. Metastasio died in 1782 at the house of his good friends, the Martinez family. He was 84 years old. Metastasio was buried in St. Michael's Church in Vienna. He left all of his money to the Martinez children. There are monuments to Metastasio in Rome and in Vienna. There are also theatres named after him in the Italian cities of Prato and Assisi. During his long life Metastasio wrote many letters to his friends. The English musician and writer, Charles Burney, translated Metastasio's letters into English. In 1796, Burney used them to write a book about the life of Metastasio. The book was called Memoirs of the Life and Writings of the Abate Metastasio. Didone Abbandonata (1724). Its title means Dido Abandoned. It tells the story of Dido, the first queen of Carthage, and her unhappy love for Aeneas. This was Metastasio's first libretto. The first opera to use this libretto was composed by Domenico Sarro. In the next 100 years more than 40 operas by other composers used this libretto. Ezio (1728). It tells the story of Flavius Aetius, a Roman general in the 5th century. Ezio is the Italian name for Aetius. Some of the many composers who used this libretto for their operas are George Frideric Handel, Christoph Willibald Gluck, and Nicola Porpora. Porpora was the first composer to use this libretto. La Clemenza di Tito (1734). The title means The Mercy of Titus. It tells the story of Titus a Roman emperor in the 1st century. This libretto was used many times. The most famous opera using it is La Clemenza di Tito composed by Wolfgang Amadeus Mozart. Achille in Sciro (1736). Its title means Achilles in Skyros. It tells the story of the Ancient Greek hero, Achilles. When Achilles was a young man, he lived on the Greek island of Skyros. Antonio Caldara was the first composer to use this libretto. His opera was performed in Vienna on 13 February 1736 to celebrate the wedding of Maria Theresa of Austria to Francis, Duke of Lorraine. The next year, Domenico Sarro composed an opera using this libretto. Sarro's opera was performed to celebrate the opening of the new Teatro di San Carlo in Naples. Another composer who used this libretto was Giovanni Paisiello. Metastasio also wrote librettos for other types of stories set to music. They were used for cantatas, oratorios, ballets and a special type of short opera called an azione. An azione mostly tells a happy or funny story. They were performed at royal courts to celebrate weddings, birthdays and special anniversaries. One azione by Metastasio was called Il Trionfo d'Amore. The title means Cupid Wins. It was performed at the Schönbrunn Palace in 1765 to celebrate the wedding of Maria Theresa of Austria's son, Joseph II. Maria Theresa's younger children all sang and danced in Il Trionfo d'Amore. This page was last changed on 22 November 2017, at 16:57.